As many as 65 models were backstage hours before the Marc Jacobs fashion show Monday night and one thing was certain, each had a different hair look. Marc wanted to bring out the character and individuality of each girl. It was like a New York night scene. There was a strong edge to each of them with fun, wild and dramatic makeup looks…very Madonna, Cyndi Lauper, Deborah Harry and Joan Jett. It has been about 10 years since the last time François Nars, creator of Nars Cosmetics, did a fashion show and Nars enjoyed every minute of fun working with Jacobs again. Jacobs really combined many eye shadow colors… from dark smoky eyes to wild, exaggerated cat eyes, with eye shadow brushed from the outer corner of the eye, tapering into a point out across the temple and to the hairline. Think Elizabeth Taylor in her most Cleopatra-esque moment. Around some of the strong eyes were vivid colors like fuchsia, at the last minute fuchsia eye shadow was added. There were perfect red lips on powder white faces and fairy-dust-like highlights on some of the model’s cheeks. 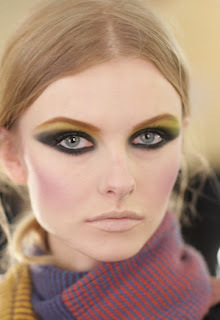 Nars favorited look personally was the smoky strong eye, because it was a more eighties inspired and eclectic look. Nars mixed in every color, including greens, cobalt blues and black, tailoring the makeup look for each model depending on what hair and outfit she wore. Guido Palau, the Redken hairstylist used lots of hair spray and gel, also creating eighties punk rock dos, frizzed out Mohawks, twisted up dos, teased Afros, slicked-backed crops and towering beehives. The binding concept among all the looks was that the girls would be ready to go clubbing after the show, and there was no doubt some of them would.